LAGOS — Africa’s richest man, Aliko Dangote, has arranged more than $4.5 billion in debt financing for his Nigerian oil refinery project and aims to start production in early 2020, he told Reuters. Dangote, who built his fortune in cement, is building the world’s largest single oil refinery with capacity of 650,000 barrels per day (bpd) to help to reduce Nigeria’s dependence on imported petroleum. Despite being a crude oil exporter, Nigeria imports the bulk of its petroleum because of a lack of domestic refining capacity. Lenders would commit about $3.15 billion, with the World Bank’s private sector arm providing $150 million, Dangote said, adding that he was investing more than 60 percent from his own cash flow. 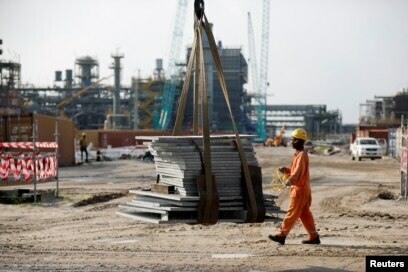 A construction worker assists with moving building materials on a lift at the Dangote Oil Refinery under construction, in Ibeju Lekki district, on the outskirts of Lagos, Nigeria, July 5, 2018. Dangote Group has said that Standard Chartered Bank was arranging funds for the project. Nigeria’s central bank would provide guarantees for about 575 billion naira in local currency for 10 years, with African Development Bank providing a $300 million loan. Trade banks from China, India and some European countries are also in the mix, Dangote said. The planned refinery and petrochemical complex is expected to account for half of Dangote’s sprawling assets when it is finished next year. Last week Dangote signed a loan of $650 million with the African Export-Import Bank (Afreximbank) for the project. Dangote said he was looking to acquire more oilfields as his focus shift towards the oil sector to feed the refinery. Outside of oil, Dangote said he is also eyeing English soccer team Arsenal. “We will go after Arsenal from 2020 … even if somebody buys, we will still go after it,” he told Reuters, referring to reports that Russian billionaire Alisher Usmanov was looking to sell his 30 percent stake in the club.